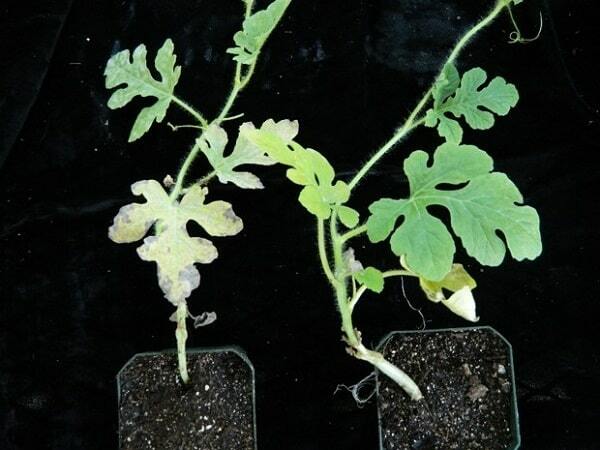 Reduced development of powdery mildew on true leaves of the susceptible watermelon scion ‘Mickey Lee’ grafted on a powdery mildew resistant watermelon rootstock (plant on right) compared to sever powdery mildew on ‘Mickey Lee’ grafted on a susceptible rootstock (plant on left). CucCAP researchers at the U.S. Vegetable Laboratory, USDA-ARS in Charleston, SC, including Shaker Kousik, Mihir Mandal, Jennifer Ikerd collaborated with Richard Hassell of Clemson University to demonstrate the ability of powdery mildew resistant rootstocks to protect susceptible watermelon scion seedlings. The group evaluated 25 watermelon and 4 bottle gourd rootstocks and determined that bottle gourd rootstocks were very effective in imparting resistance to the susceptible watermelon scion. The powdery mildew resistant rootstocks have the potential to reduce powdery mildew development on commercially available watermelon cultivars that are not resistant to this disease, thus leading to reduction in pesticide applications. The group also released the two bottle gourd rootstocks that were the most effective in conferring resistance to the susceptible watermelon scion in August. Featured Articles, Watermelon Grafted watermelon, Hassell Lab @ Clemson University, Kousik Lab @ USDA-ARS, Powdery Mildew. permalink.